The Deacon’s elm tree instantly became a place where patriots met. A meeting hall of sorts. The Loyal Nine hired Ebenezer McIntosh, who was known for his ability to muster up a crowd and rally them to a cause, which he did too well. On August 26th, he led a revolt against Lieutenant Governor Thomas Hutchinson that resulted in the near destruction of his house. The town held a meeting and unanimously voted to condemn the violence. The Loyal Nine cut ties with McIntosh, replacing him with men closer to their group. On September 11th, hundreds of Bostonians gathered around the tree to witness the nailing of a copper plate bearing the title “Tree of Liberty” to the elm’s trunk. It became the colonists’ symbol for freedom. While the tree donned the name “Liberty Tree”, the area beneath its branches became known as “Liberty Hall.” Towns throughout the colonies began denoting their own Liberty Trees in support of the patriots’ cause. When Oliver decided he would resign his position as Stamp Tax collector, he planned on doing so at the Town House, where all official British business was conducted. However, the Loyal Nine demanded he quit at their official political office, the Liberty Tree. 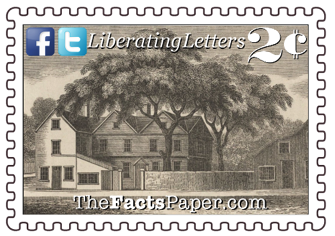 When Parliament passed the Stamp Act of 1765, colonists challenged Britain’s authority and purpose for doing it. Charges of suppression of free speech, liberty and freedom were shouted throughout the streets. All paper products produced in the American colonies required a tax. This included legal documents, such as permits and contracts, as well as publications such as pamphlets, leaflets, and newspapers. The tax even went as far as to apply to advertisements, flyers and playing cards. Since the tax affected information instruments, the colonists regarded it as a way the king could censor their ability to write and read opinions freely. (see Acts Of Oppression) Described as a “knowledge tax,” the Stamp Act was to go into effect on November 1st. To protest the tax and bring attention to the cause, an anonymous revolutionary group called the “Loyal Nine,” arranged the display on the tree. The elm was located on the property of Deacon John Elliott, just behind his white fence. It was also across the street from Thomas Chase’s distillery, a member of the “Loyal Nine”. The morning sun spread a golden blanket over the city. A gentle breeze brushed across the peninsula of Boston. From a big, beautiful 120-year-old elm tree swung an effigy of a local colonist and merchant. Located on the only street in and out of the city, hundreds of Bostonians witnessed the display as they began their day on August 14, 1765. The effigy had pinned to it a piece of paper with “A.O.” written on it. Everyone knew it was a reference to Andrew Oliver, who agreed to collect Parliament’s new Stamp Tax from the colonists. Next to Oliver hung a British Calvary jackboot, meant to represent the former Prime Minister Lord Bute. An image resembling the devil emerged from the boot holding a scroll marked “Stamp Act.” Colonists incorrectly deemed Bute responsible for the legislation. Throughout the day, crowds gathered at the foot of the elm, discussing the Stamp Act while their anger festered. The governor ordered the sheriff to remove the effigy, yet the deputies reported they could not perform the task out of fear for their own safety. That evening, the irate crowd took to action as it made its way to Kirby Street where Oliver’s new Stamp Act office was located. Before long, the entire building was dismantled. They then continued on to Oliver’s house, where they all but destroyed it as well. The colonists’ anger towards the crown was only matched by their passion for liberty. The Loyal Nine morphed into the Sons of Liberty, led by Samuel Adams and included such patriots as John Hancock, Patrick Henry, Paul Revere, James Otis Jr., and Benjamin Rush. Trials were held by the patriots under the tree against those remaining loyal to the crown, often including punishment delivered by the patriots. As the British saw the importance of the Liberty Tree grow, so did their hatred of it. To mock the colonists and their cry for liberty, Redcoats tarred and feathered Thomas Ditson before forcing him to march in front of the tree. On the other hand, in 1774, the Sons of Liberty tarred and feathered tax collector John Malcolm underneath their symbol of freedom. The tree became more than just a meeting place. It was also used to bring awareness to the results of fighting back. When custom officials seized John Hancock’s sloop Liberty in 1768, patriots responded by taking the custom commissioner’s boat out of the harbor, hauling it all the way to the Liberty Tree, convicted it in a trial, and burned it in the nearby Boston Common. (see Acts Of Oppression) To expose British tyranny, Adams scheduled funeral processions to pass by the tree. In February 1770, a British informant carelessly shot a young boy throwing rocks at his window during an argument he started with colonists. The boy’s casket was taken to the tree on the way to the cemetery. Just two weeks later, another procession passed under the branches of the Liberty Tree to mourn the five patriots killed in the Boston Massacre on March 5th. Shortly after the American Revolution began, the British captured Boston. (see Let Liberty Ring) As an act of defiance against the patriots, Boston loyalists cut the Liberty Tree down. After the British abandoned Boston, patriots continued the spirit of the tree, calling it the “Liberty Stump.” They even constructed a “Liberty Pole” on the 11th Anniversary of the Stamp Act protest, however it never regained it’s once cherished glory. Yet, it didn’t seem to matter as liberty did not live in the tree. It lived in the hearts of the American patriots. Thomas Paine grasped the importance of the Liberty Tree in a poem published in the Pennsylvania Gazette in 1775. Liberty, many have decided it is best to let the history of the Liberty Tree perish along with the actual tree. The connections it had to the aggressive, outraged, rebellious revolutionaries would be better forgotten. However, that anger and violence was in direct response to a government that refused to listen to the grievances of the people. As a result, they felt pushed and forced into actions that would get the attention of those in power. Are they any different from those of us today that have voted for and trusted our elected officials to do what they promised, only to have those officials turn their backs on the people once in Washington? This is the main reason President Donald Trump received the support he did. It was from sheer frustration and exhaustion of the people tired of being ignored. Yet Washington still has failed to receive the message. They never learned the lessons of the Liberty Tree. When you continue to push a people down, oppressing them for your own benefit, eventually, they will rise up against you. The result is the revolt at the Liberty Tree. After being almost completely lost in time, a journalist revived the story of the Liberty Tree in 1966. Now, a bronze plaque lays on the sidewalk near the location of the actual tree. In addition, a plaque bearing the inscription “SONS OF LIBERTY, 1776; INDEPENDENCE of their COUNTRY, 1776,” along with a sculpture of a tree, is displayed on the building. The symbolism of the tree was so powerful at the time, it even influenced France during their Revolution where a liberty elm was planted and still stands. (see Storming The Bastille). When Marquis de Lafayette visited the states in 1825, he purposely made sure to visit the “Liberty Stump,” where he stated, "the world should never forget the spot where once stood Liberty Tree, so famous in your annals." Except, we almost have. As the Pemberton Papers so eloquently stated, on the tree’s site was “born the first fruits of Liberty in America.” However, as observed by Thomas Jefferson, “The tree of liberty must be refreshed from time to time with the blood of patriots & tyrants.” Freedom is never free, Liberty, and has to constantly be fought for. Never forget that and never stop fighting.